Merciful Can never die or get stuck. The game is always beatable and no progress can ever be lost. The player passes by a key, then walks over a bridge to a locked door. The player can recross the bridge to pick up the missing key. There is a button labeled "Inorganic Vaporizer Ray". The game does not allow the player to press it, bringing up a message that it would cause her or him to lose all of her or his items. Polite Can die, but cannot get stuck. Beatable as long as the player has at least one save (no matter where it is), but some progress may be lost if the player character dies and the most recent save is far back. The player passes by a key, then arrives at a bridge. The game warns the player that the bridge is unstable. If the player crosses (and sees the locked door), the bridge collapses, and the player dies (e.g. the player character may realize they have no way to proceed and automatically jump off the cliff that the bridge spanned). 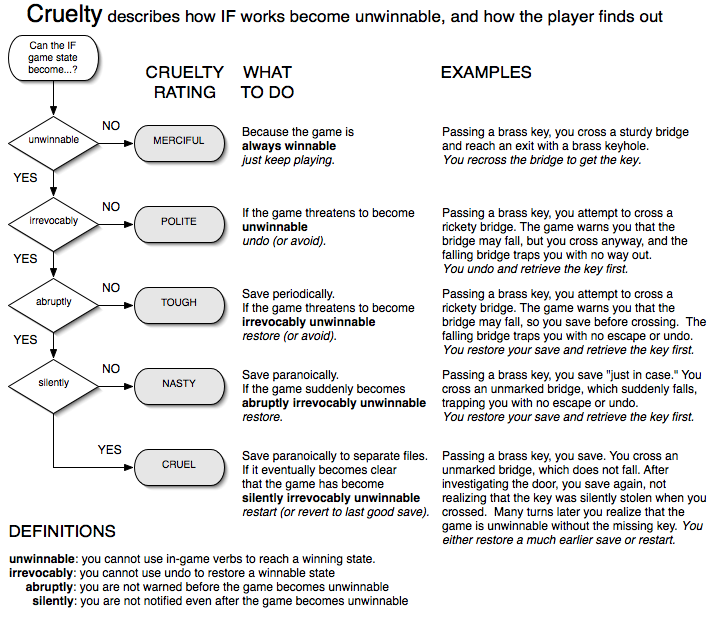 It is impossible for the player to save the game in a stuck situation and render the whole game unwinnable. There is a button labeled "Inorganic Vaporizer Ray". If the player presses it, their items vanish, along with their pacemaker, causing the player character to die. It is not possible to save in a stuck situation. Tough Can get stuck, but this is obvious beforehand. Beatable by saving at obvious points. The player passes by a key, then arrives at a bridge. The game warns the player that the bridge is unstable. If the player crosses, the bridge falls and the player is stuck at the locked door without the key. Saving here would render the game unwinnable. Avoidable if the player saves upon seeing the bridge warning. If the player presses the button, their items vanish, making the game impossible to complete. Saving here renders the game unwinnable. Avoidable if the player saves upon reading the button's obviously dangerous label. Nasty Can get stuck, but this is obvious afterward. Beatable by saving frequently or arbitrarily. The player passes by a key, then arrives at a regular bridge with no warning. If the player crosses, the bridge unpredictably falls and the player is stuck. Avoidable if the player had saved frequently/arbitrarily before crossing the bridge. It is obvious that saving after the bridge falls renders the game unwinnable, even though there is no warning beforehand. The button is unlabeled, but after pressing it, the game informs the player that their items are gone (or the player character abruptly realizes that their bag is much lighter, etc.). It is obvious that saving after this point renders the game unwinnable. Cruel Can get stuck, and this is not obvious afterward. Beatable by saving arbitrarily to multiple files. The player passes by a key, then arrives at a bridge. If the player crosses and sees the locked door, a thief silently steals the key and the player is not informed. The player is stuck at this point, but it is not obvious and it is easy for the player to save after they are already stuck. The player must revert to a file where they can still see the key present. The button has no obvious effect. The player can only detect the effect of the button by obsessively checking their inventory. It is easy to save after pressing the button. The player must revert to a file where they still have their inventory. See also: winning, losing, unwinnable, deadlock. The distinctions between Polite, Tough and Nasty rely upon certain things being obvious to the player. Some will really be obvious to everyone (if the work ends in failure, everyone will agree it has become unwinnable); others are only obvious to some. Because of this, the distinction between Polite, Tough and Nasty games is not always clear, and has historically been subject to some debate. Rating a game requires comprehensive knowledge of that work, which is not always possible in works with unpublished source code (and can be difficult to discern even if source is available). Cruel A player realizing they are stuck has some clue as to where they went wrong, and a correct guess can be verified immediately. Beatable by saving to multiple files, and which files to check can be narrowed down. The player may notice that they passed a key before and it is no longer there. If the player remembers this and has multiple save files, they can figure out that crossing the bridge and the key being stolen happened at the same time, and this is immediately provable on a future playthrough. A button that seems to do nothing is unlikely to actually do nothing in IF. If the player remembers this and has multiple save files, they can figure out that the button press and the inventory vanishing happened at the same time, and this is immediately provable on a future playthrough. Evil A player realizing they are stuck has no clue where they went wrong. A correct guess can still be verified immediately. Beatable by saving to multiple files, but all of them must be searched through. The key is well-hidden, and the player is likely to not realize that they passed it. The player must obsessively check all of their save files for the missing key. However, if they know where the key is supposed to be, they can immediately prove that crossing the bridge is what causes it to be stolen. The button vaporizes all of the player's items and also opens the door to the next area. To actually proceed, the player must solve another non-obvious puzzle to disable the button's first function while keeping its second. The player cannot narrow down which save files contain the bad move and must obsessively check them all to figure out at which point their inventory vanished and what caused it. However, if they guess that the button was the cause, this is immediately provable on a future playthrough. Hell A correct guess cannot be verified immediately. Almost certainly only beatable by consulting a walkthrough, as checking save files is not enough. If the player chooses to cross the bridge without the well-hidden key, the key is not stolen but a future item far beyond the door is stolen instead. The player may cross the bridge, see the locked door, go back to find the key, open the door, and render the game silently unwinnable but not provable until much later. Even if the player can tell that the future item has been stolen when they get there (e.g. they see a broken safe), they cannot figure out that the cause was crossing the much earlier bridge without the much earlier key. The button opens the door to the next area, but its vaporizer effect is delayed, happening dozens of turns later, a random number of turns later, or even one turn before the player needs each item. Even if the player obsessively checks their inventory every turn, they cannot figure out that the cause was the button, half of whose effects needed to be disabled. A save file in an unwinnable state is indistinguishable from a save file in a winnable state until much later, so it is very hard to prove that a guess is correct. The rec.games.int-fiction posting that initially inspired this rating system. Andrew's original elaboration of the system. Unwinnable By Design at the TV Tropes Wiki. Provides more examples, extends Zarf's original scale, and also gives numerous real-game examples from Infocom, Sierra, and more. Unwinnable by Design on All The Tropes. This page was last modified on 22 January 2019, at 07:15.